Common levothyroxine side effects include nausea, vomiting, headache, irritability, insomnia, fever, weight loss, and temporary hair loss, among others. Serious, albeit more rare, side effects include chest pain and irregular heartbeat. Persistence of worsening of any of these conditions may indicate either an allergic reaction or overdose. Aside from the temporary hair loss, which is most common in children, particularly during the first month of treatment, these common side effects are experienced by all patients, with little to no gender or age specificity. These symptoms may be a signal of a thyroid hormone imbalance—which can impair mental and physical functioning—or of an allergic reaction to the drug. If a patient experiences any of these symptoms, or a persistence of the commonly reported symptoms listed above, he or she should seek immediate medical attention. Most often, side effects of levothyroxine arise as a result of improper dosage. If the dose administered is too low, and is administered for a long period of time, the body’s TSH (thyroid-stimulated hormone) values will be suppressed. This may cause heart attack, heart irregularities, or decreases in bone density. Individuals who are administered too much levothyroxine may experience similar side effects, as well as abdominal pain, confusion, and agitation. Serious overdoses can induce a coma, and may require beta-blockers for treatment. Massive overdoses can be fatal. Levothyroxine is one of the few prescription medications approved safe for pregnant women and nursing mothers. This does not mean it is risk-free during pregnancy—studies indicate that an excess of the thyroid hormone can cause birth defects. Therefore, it is important for pregnant women who take the drug to be closely monitored by their physician, and submit to regular blood tests to ensure proper dosage. 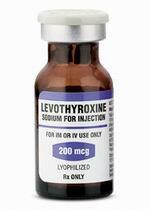 Furthermore, while traces of levothyroxine are passed on to infants via breastfeeding, the levels are almost negligible and have not been found to affect the newborn. Patients taking levothyroxine have reported weight fluctuations both in terms of loss and gain. Weight loss is a common side effect, though some physicians believe it may actually be a side effect of a side effect, as the drug has also been known to cause nausea and loss of appetite. Other patients, however, have reported weight gain after beginning treatment. In either case, weight change may be a result of the thyroid adjusting to new hormone levels, which can affect metabolism. Individuals taking levothyroxine should also be aware of the side effects that may arise when the drug is combined with other foods and supplements. For example, soy products and grapefruit juice, as well as iron and calcium supplements, have been known interfere with the drug’s absorption and efficacy. Other studies show that coffee and bran may also prevent the drug from being fully absorbed by the body. More seriously, taking levothyroxine with lithium or ketamine can cause hypertension, tachycardia, or a worsened hypothyroidism. Levothyroxine has been approved for use in almost all patients with an underactive thyroid disorder, largely because the drug is merely acting as a substitute for a hormone that already occurs in the body. Further, most people do not experience any of the serious side effects. However, individuals with adrenal gland problems or preexisting heart conditions (especially those who have suffered heart attacks) should avoid levothyroxine.